This is the Book and CD-ROM Combo version of this book. As leading authorities worldwide on setting part stocking levels for safety stocks to support the production process, the authors have shown that between 25 and 50 percent of the inventory investment is not necessary. 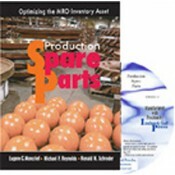 Thus the overall objective of this book is to instruct readers in how to optimize their company’s spare parts asset. This compilation of the best techniques and practices for optimizing MRO inventory offers numerous case studies showing the best and not so good ways to improve plant inventory performance. Based on practical solutions to everyday inventory problems, it uses simple, but useful metrics for setting and monitoring goals. • Covers stocking theory and practice. • Uses the Pareto Principal throughout as the best way to achieve superior results with a minimum of investment of time by plant personnel. • Includes the following topics: the risks inherent in setting inventory stocking levels, setting the reorder point, setting the reorder quantity, determining excess inventory, how to avoid unnecessary purchases of spares, and how to set and monitor goals for inventory improvement.